THOUSAND OAKS, California: A 28-year-old US Marine Corps combat veteran opened fire in a crowded country music bar in California, killing 12 people including a police officer who rushed in and exchanged shots with the gunman, authorities said on Thursday. 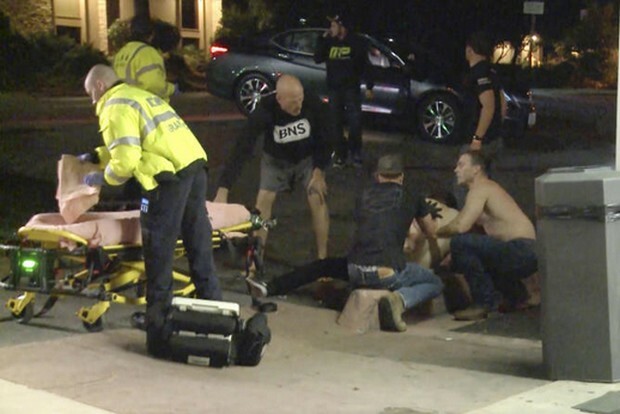 Terrified patrons -- many of them college students -- scrambled for the exits after the gunman started shooting people with a handgun in the Borderline Bar and Grill at around 11:20 pm on Wednesday. "They ran out of the back doors, they broke windows, they went through windows. They hid up in the attic, they hid in the bathroom," Ventura County Sheriff Geoff Dean said. The assailant, identified as Ian David Long, a troubled former machine gunner who served a tour in Afghanistan, died of a self-inflicted gunshot wound. Dean told reporters that Long shot an unarmed security guard who was standing outside the bar before entering and opening fire at random inside. Twenty-three people were injured -- some from "jumping out of windows, diving under tables," Dean said -- and treated at area hospitals. A year ago, 58 people were shot dead at a country music festival in Las Vegas, the worst mass shooting in modern US history, and several of the patrons in the California bar had also been at the Nevada concert. "I can't believe I'm saying this again," Molly Maurer posted on Facebook. "I'm alive and I'm home safe. According to the Pentagon, Long served in the Marine Corps from August 2008 to March 2013. He attained the rank of corporal and saw combat while deployed in Afghanistan from November 2010 to June 2011. "He had perfect form," bar patron Teylor Whittler told Fox News. "He looked like he knew what he was doing." Police on Thursday were searching Long's house in Newbury Park, near Thousand Oaks, where he reportedly lived with his mother. Long was found dead by police in an office at the bar and is believed to have shot himself, Dean said. Authorities so far had no indication of a motive, or of any connection to terrorism.